I had this nice little intro I was planning on writing before this recipe but then I realized it doesn’t matter. 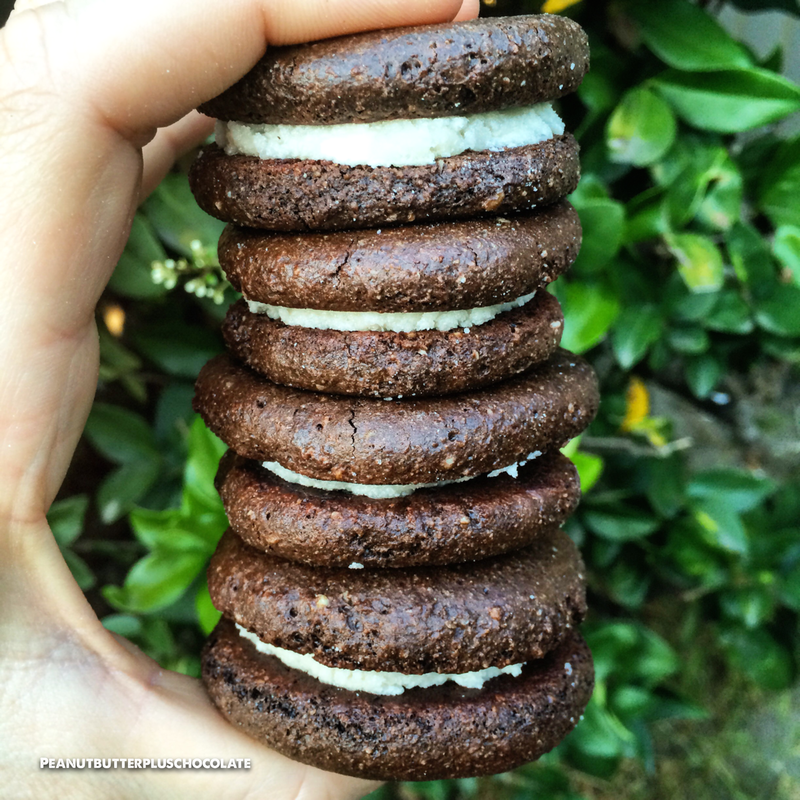 The point of this post is that I made HEALTHY OREOS and they are sinfully delicious. They are made with all natural ingredients and they take less than 30 minutes to make. That’s all you need to know right? Oh yeah, they are gluten free! In a bowl mix flours, cocoa powder, corn starch, coconut sugar and baking soda together. Add maple syrup and vanilla extract and mix with a fork. Add egg and continue mixing until everything is combined. Separate cookie dough into 16 small balls and place on a baking sheet lined with parchment paper. Wet your finger so it doesn’t stick and press the balls flat. Bake for 4-5 minutes at 350 F. While cookies are cooling, mix coconut butter and vanilla protein powder together to make the filling. Once the cookies have cooled, spread the filling onto 8 cookies and sandwich it with another cookie. Enjoy with a nice cup of almond milk! I recently discovered Nikki’s Coconut Butter–and I am obsessed! I love it so much I actually contemplated changing my blog name to “Coconut Butter Plus Chocolate” I mean, that’s how amazing this stuff is! Much like peanut butter you can spread it on anything. You can cook with it, bake with it and substitute it for any butter ingredient–just like peanut butter. 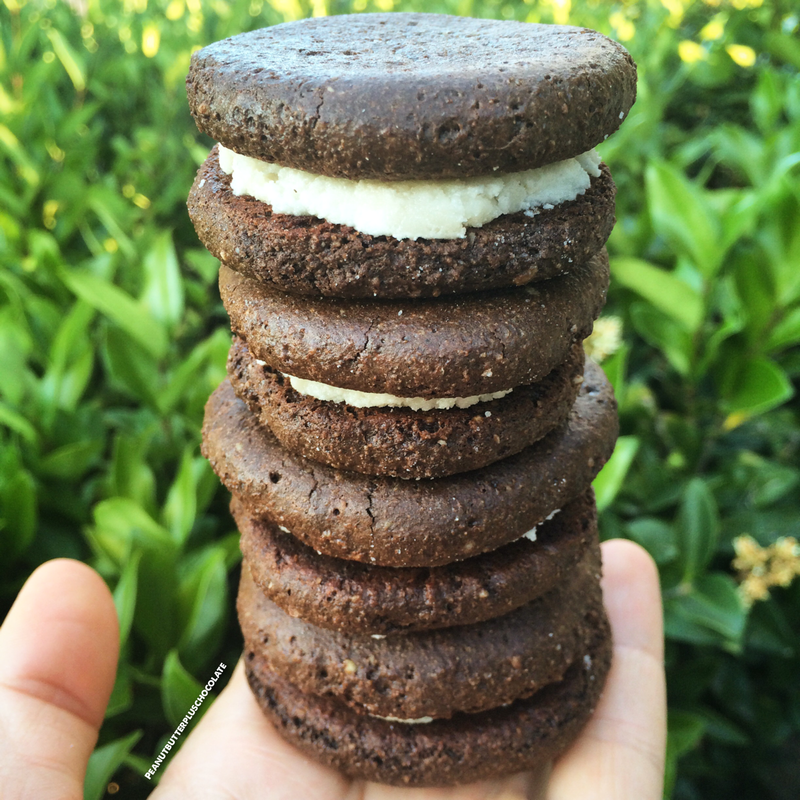 Melt Mint Chocolate Chip Coconut Butter with almond butter and 1 tbsp. honey and then stir until well combined. 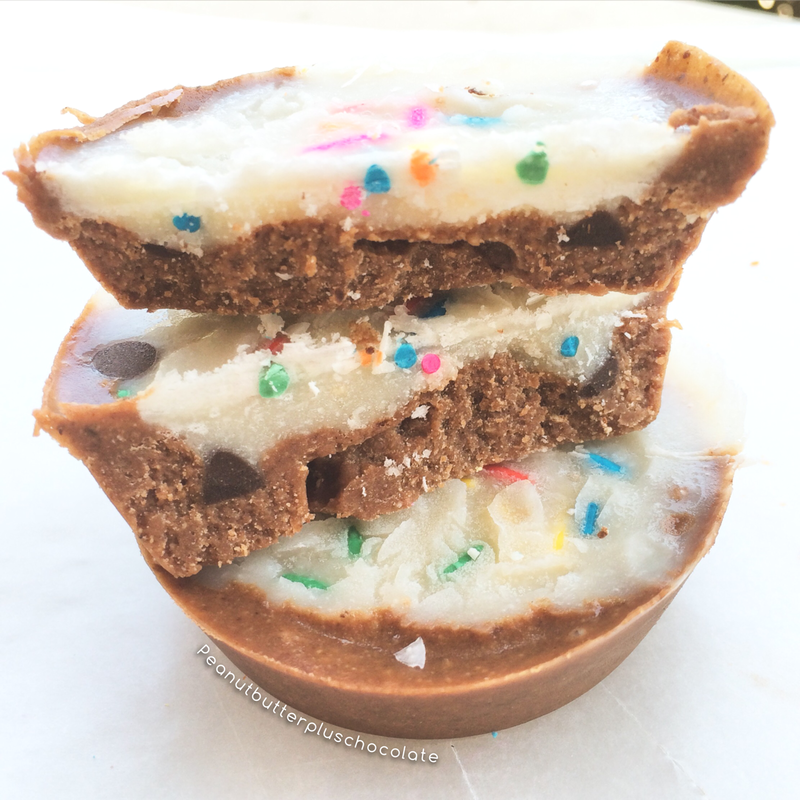 Pour into 4 silicone cupcake molds and sprinkle evenly with chocolate chips. Melt together vanilla cupcake batter and 1 tbsp. honey and stir until combined. Pour vanilla mix into the center of the mint chocolate mix. Top with sprinkles and freeze for at least an hour before serving. It’s a popular known fact that coconut oil is great for moisturizing your hair and skin, but did you know that it can aide in weight-loss? Coconut oil has a long list of holistic benefits but it can also increase your energy expenditure, helping your burn more fat–especially in your abdominal area! 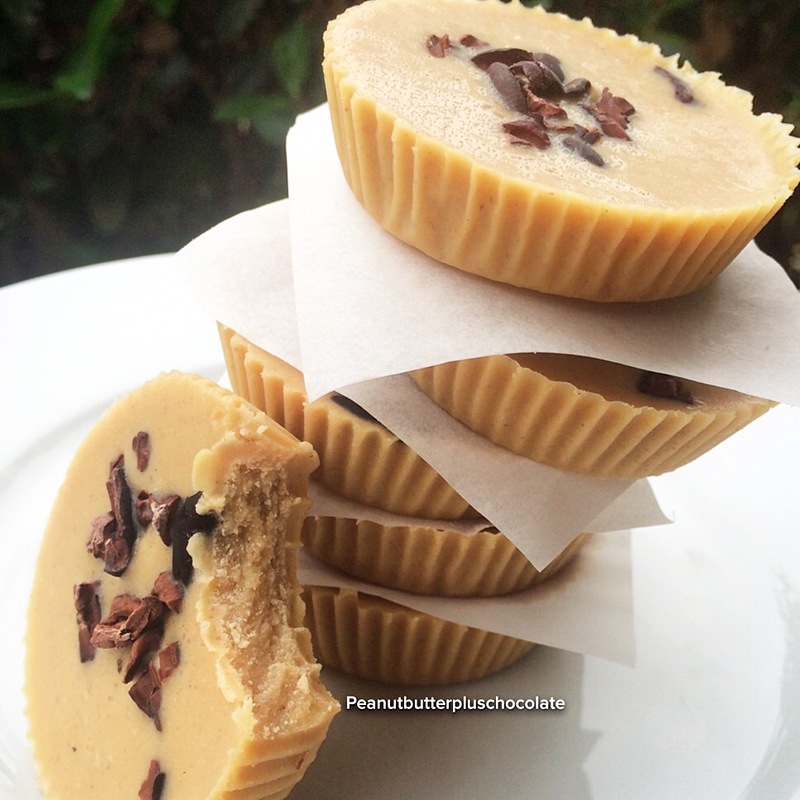 As soon as I learned that I could possibly lose more belly fat by consuming more coconut, I did what any person would do; I made peanut butter fudge with the main ingredient being coconut butter! I get all of my ingredients from this wonderful site called VitaCost.com–they have the cheapest whole food ingredients and they deliver the next day! Add all ingredients (except cocoa nibs and salt) to a glass bowl and place over a small pot of boiling water. Stir until combined. Remove from heat and pour evenly into 7 cupcake liners. Sprinkle with nibs and let cool in the refrigerator or freezer for 2 hours. Peel off liners and enjoy! Sinfully Healthy Pancakes Under 300 Calories! I used Abs Chocolate Chip Protein Pancake and Waffle Mix and followed the directions: one scoop abs mix, 3/4 cup almond milk, 3/4 cup egg whites. Mix ingredients together and cook on medium heat. I also added 1 tbsp. ground flax seed for extra fiber. The pancakes themselves are just about 200 calories but then I add all of that peanut butter and chocolate they ended up just under 300! How though? Are you ready for all of your peanut butter prayers to be answered? Powdered Peanut Butter. I named a blog after peanut butter so it’s probably pretty obvious that I have an addiction to it. And as you probably already know, peanut but is very high in fat. Yes, it’s the healthy fat but too much of anything is never a good thing. When I discovered PB2, my life changed. PB2 Bell Plantation was the first brand I tried and I loved it. There’s many powdered peanut butter brands on the market and honestly, I think they all taste very similar but the point is that you are getting 85% less calories and fat in comparison to regular peanut butter. PB2 you can get at target for around 5 bucks. Other brands you can get online for cheaper. I even heard you can get a big family size of PB Fit at Sam’s Club for 10 bucks. I always pick some up when I do a vitacost.com order. My method: mix 2 tbsp. of powdered peanut butter with 1-2 tbsp. of water (depending on the consistency I am going for) and then add stevia and cinnamon to taste (sometimes if I’m feeling sassy I might add some chocolate protein powder to the mix). The chocolate drizzle in this photo is actually coconut butter. I used Dark Chocolate Fudge Coconut Butter by Nikki’s Coconut Butter. Mix all recipe ingredients together. Prepare a pan with non-stick coconut oil spray and use a small cookie scoop to make 6 small pancakes cooked on medium heat until golden brown. Layer with peanut butter mixture and drizzle with coconut butter. Enjoy! I was born and raised in a small town just outside of Las Vegas, NV, so I understand the desire for frozen foods when the summers are long and hot! I don’t know about you, but my “popsicle eating days without gaining a pound” are long gone. However, the cravings remain. I found these adorable popsicle molds at Marshals for 6 bucks and I knew right away what I had to do. I needed to create a popsicle that was beneficial after a workout because that’s usually the time of day when I’m the hottest or sweatiest or just plain want something cold to eat. 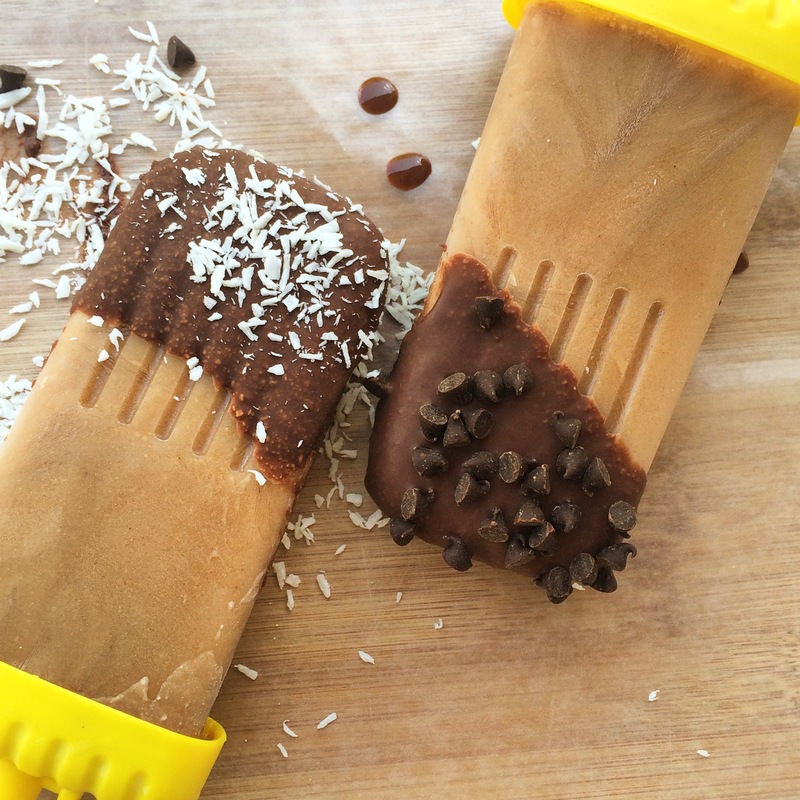 Each popsicle has only 179 calories, 15 grams of protein, 9 grams of fat and only 6 carbohydrates (and that’s including the chocolate!). So here it is, only four ingredients and you can easily adapt this recipe for different flavor popsicles by using your favorite protein. Whisk together milk, protein powder and yogurt then pour into molds. The recipe should make about 4 popsicles depending the size of your molds. Freeze for at least 6 hours. Run molds under hot water for a few seconds before removing. 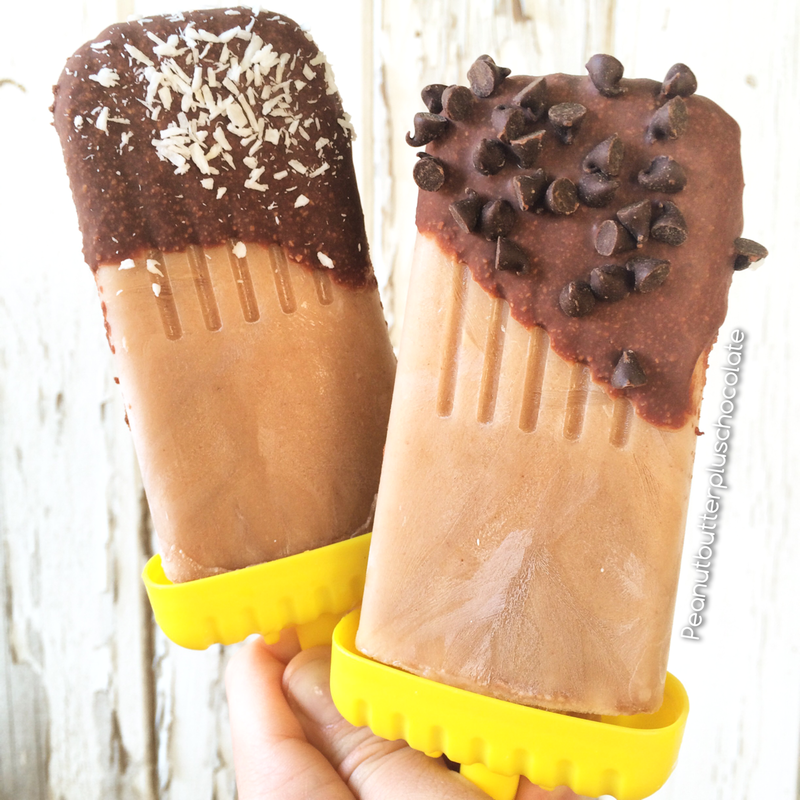 Dip popsicles in semi melted coconut butter and returned to freezer for 5 minutes before serving. Optional: shredded coconut and chocolate chip garnish. When I was a kid I remember going to the grocery store with my mom and we would always stop by the bakery so she could get my sister and I chocolate thumbprint cookies. They were magical and delicious. It was the cookie of my childhood. Now it seems like forever since I’ve heard anyone talk about a thumbprint cookie. I almost forgot they existed, until my mom mention a story that triggered my memory. 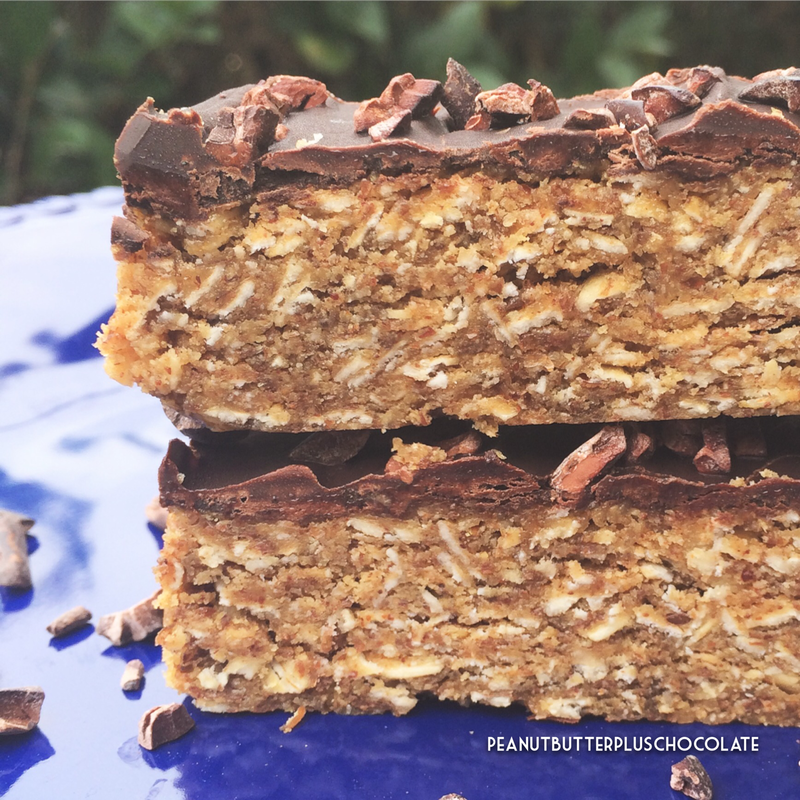 I knew right then that my entire day would be spent trying to recreate the cookie from my past–a healthy version, of course! 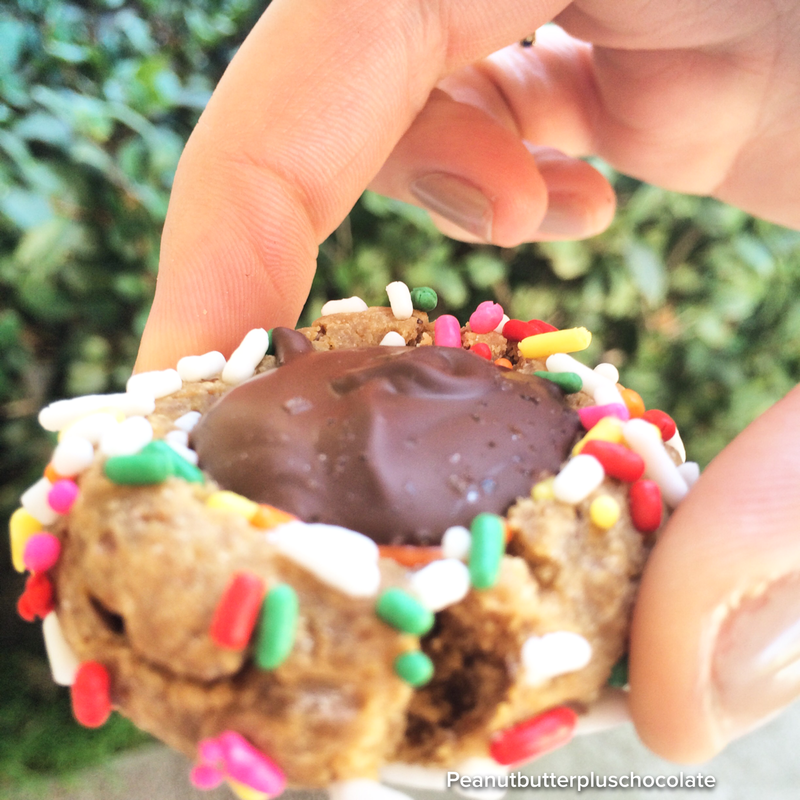 Recipe makes 6 delicious-mouth watering-dangerously healthy cookies! For paleo use almond butter. Mix coconut flour, flax, sugar and baking powder together. Add peanut butter, vanilla and egg. 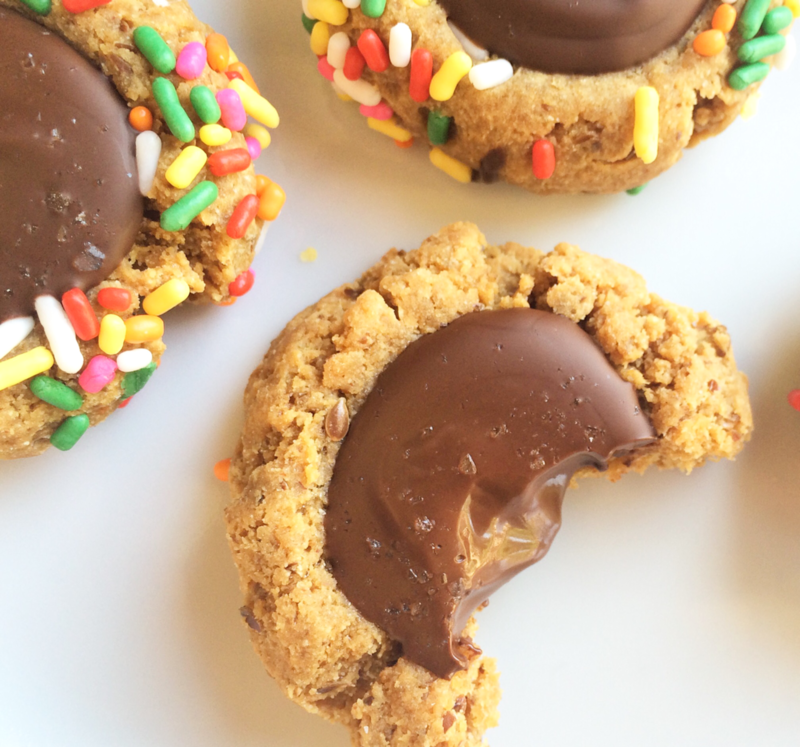 Once everything is mixed together, use a cookie scoop to make 6 balls and roll them in sprinkles. Place balls on a baking sheet lined with parchment paper and press them down using the back of the cookie scoop, your thumb, a spoon or a melon baller–they all work perfectly. Bake for 7-8 minutes at 350f. While cookies are baking, melt chocolate chips and coconut oil. I used a small glass bowl over a smaller pot of boiling water. Fill your cookies with chocolate and let cool and enjoy!